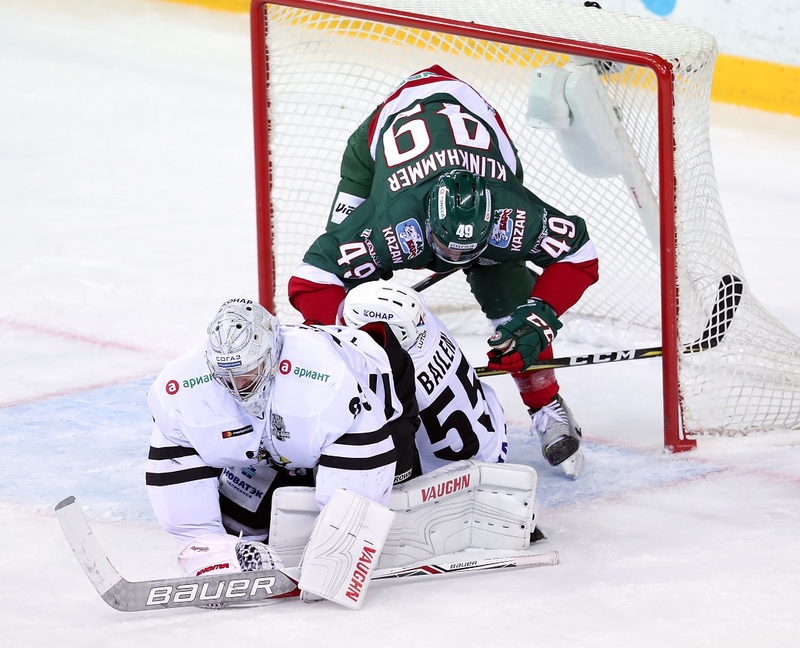 Goals from Justin Azevedo and Stanislav Galiyev saw Ak Bars come from behind to win the opening game of this year’s Eastern Conference Final. The home team was slightly stronger throughout the game, but struggled to solve Pavel Francouz early on and fell behind to a Richard Gynge goal early in the second period. The early stages were cautious, with neither team eager to over commit on offense at the start. Gradually, though, Ak Bars took the initiative and finished the session with a few presentable opportunities. After a strong finish to the first period, Ak Bars began the second on the power play – and thought it had gone ahead in the 21stminute. Justin Azevedo claimed it after the puck went on off his skate during a battle on the slot, but the review revealed a kicking motion and the play was ruled out. However, Ak Bars was left to rue its inability to take its chances when Traktor went in front in the 26th minute. The team’s Swedish connection clicked once again, with Linus Videll winning the puck behind the goal line and picking out a pass for Richard Gynge three metres in front of Emil Garipov’s net. Traktor’s leading scorer in post-season despatched the chance to open the scoring and make it three games in a row where he’s found the net. That saw the host look to raise its game another notch. The stats for the second period were fairly even, but it was Ak Bars that was creating the more dangerous chances. Glukhov drew a big pad save from Francouz, Galiyev was a whisker away from deflecting a Danis Zaripov feed into the net and Azevedo got away from Nick Bailen to fire in a shot that bounced off post and bar before dropping safely. Traktor’s best chance fell to Alexander Sharov, who was released one-on-one with Garipov but could not extend his team’s lead. Traktor then had to defend a 3-on-5 situation after Artyom Borodkin and Yury Petrov collected minors in the last minute of the second period. The visitor shut down that power play but remained under intense pressure. Midway through the final stanza, the shot count read 12-1 in Ak Bars’ favor, but Francouz was proving a stubborn obstacle. That all changed with a pair of quick goals. First came Galiyev’s tying effort, created by Roman Manukhov’s surge from the blue line that left two Traktor defenseman trailing in his wake. Inspired by that success, Ak Bars continued to pile on the pressure and went in front less than three minutes later through Azevedo. Anton Lander had the vision to pick up a burst of acceleration that put his strike partner in space around the face-off spot. Azevedo took one touch to control the puck with his skate before swivelling to fire off a shot that flashed inside Francouz’s near post. For the Canadian, that was the seventh time in eight games where he’d got among the points; he moves to 16 (6+10) points for the playoffs. Traktor called a time out, but Lander was closest to getting the next goal when he won a foot race and flashed in a shot from the left. This time, Francouz was waiting to pluck the puck and keep his team in the game. There was still some defense left for Ak Bars, especially after a late penalty for Nikita Lyamkin. Ivan Vishnevsky fired a shot just past the post, Paul Szczechura went narrowly over the bar, but Traktor could not force the game into overtime.